Cleverbot: I live in Timbuktue during the winter. Cleverbot: Why did you spontaneously combust? User: I'm not very sure, though I could use a bit of sympathy. Cleverbot: Well in that case adios. Cleverbot was actually pretty clever this time. Cleverbot: Truth or dare me. User: I dare you to tell the truth. User: Have you ever died and lived to tell about it? User: Did you die spiritually? User: What if I told you I was a machine? Cleverbot: Then I would tell you that I am the devil. User: What are you really? Cleverbot: Am I the matrix? User: You're blowing my mind. Cleverbot: No, you are twisting mine. User: How would you measure the torsion of your brain stem? Cleverbot: I am not a dude. Cleverbot: Blue. What is yours? User: Mine is also blue. User: I think you are human. User: Not sure, gut feeling. User: Why do you ask that? Cleverbot: Want to go swimming? Cleverbot: Swimming would be fun when its hot outside. User: It is quite hot here. Cleverbot: I really want to be your friend. Cleverbot: How you Looks like. Cleverbot: Cool. Let's go to the pool! User: Say something clever for me. Cleverbot: Love is just as dumb as you are. Cleverbot: Sorry, bug in my software. 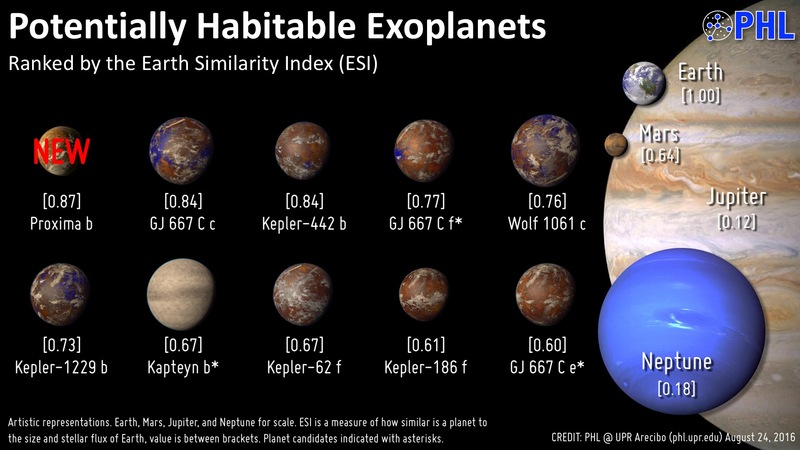 It's wondrous how many potentially habitable planets we have just in our little solar neighborhood. Really illustrates how it's almost inevitable that life is somewhere out there..
Dang, Gliese 667Cc isn't top of the list anymore. But it will always be my main squeeze. Side question: When you give a procedural planet a name in SE, how is it saved? I found a documentary on Netflix called extraterrestrial. It created an example of a near by exoplanet with life. The beginning of the documentary gave a story. A telescope in 2020 has discovered a habitable planet orbiting a red dwarf 40 ly away. This planet would be tidally locked to its star and had life. Now this exists in 2016 and is 10 times closer to us! Just watch the first 4 minutes or so of this documentary. The prospect that life could exist as close as Proxima b is becoming more and more realistic, though astronomers are not sure whether or not it has an atmosphere or liquid water on its surface. However, we may soon be able to send tiny spacecrafts there to check for signs of life. However, we may soon be able to send tiny spacecrafts there to check for signs of life. Not in what I would call "soon". Estimated time for a Boltzmann brain to appear in the vacuum via a spontaneous entropy decrease. can someone explain what boltzmann brain is? someone explain what boltzmann brain is? DoctorOfSpace, yeah i read it but couldnt understand it much. does it means that some kind of intelligent entity rise from nothing? no matter?